Committing to the journey towards a possible third Malcolm Baldrige National Quality Award, Southcentral Foundation employees join the SCF Board of Directors and President/CEO Dr. Katherine Gottlieb on stage at the award ceremony. Employees from Southcentral Foundation attended the 30th Annual Quest for Excellence Conference in Baltimore, Maryland. 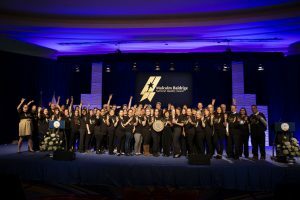 The conference, hosted by the Baldrige Performance Excellence Program, offers an opportunity to learn improvement practices from current and previous Baldrige award winners. In addition to accepting SCF’s second Malcolm Baldrige National Quality Award, SCF employees attended and taught several sessions on Baldrige categories. The learning will support continued improvement for the Nuka System of Care and the customer-owner experience. The Baldridge Program was designed to support performance excellence and drive the U.S. and global economies to be robust and dynamic by recognizing leaders in six areas: manufacturing, service, small business, education, health care, and government and nonprofit. In addition to recognizing a leader in each sector annually, Baldrige provides ongoing assessments, training, tools, and education to share best practices of national role models. The Quest conference provided the opportunity to share SCF’s story of customer-driven improvement, and to learn improvement techniques from other high-performing organizations. These techniques will help SCF improve the customer experience as we walk together on this journey toward wellness.